A passion for freedom, innovation and a group of enthusiastic volunteers is all it takes to make a difference for North Korean refugees, according to Casey Lartigue and Lee Eun-koo, cofounders and codirectors of Teach North Korean Refugees. The nongovernmental organization will hold the third TNKR English Speech Contest on Feb. 27, another milestone in the organization’s three-year journey. TNKR began in 2013, when Lartigue met North Koreans out socially. Meeting individuals who had fought for freedom sparked a light in Lartigue that has continued to drive his passion for the cause. The American expat runs the organization with Lee and the support of foreign and local volunteers, who take time each month to teach English to North Korean refugees. With the focus initially on offering opportunities for refugees to receive tutoring from volunteer teachers, Lartigue introduced the speech contest as a second track last year, which focuses on public speaking and writing, to “get the refugees active” in the program. Eom Yeong-nam, a North Korean defector and special ambassador for TNKR, will compete at this year’s event and is looking forward to speaking publicly about his story. Eom joined TNKR 10 months ago, and says the tutors and coaches he has had in this time have helped him develop the English skills he needs to reach his personal and professional goals. Lartigue hopes to put the proposals from Eom and his fellow competitors together to help the refugees raise money to implement them. Previous winners include Lee Sung-ju, who now studies at the U.K.’s University of Warwick, and Oh Se-hyek, the first refugee to be sponsored by the British Foreign Office. TKNR also offers in-house tutoring during office hours for those who do not have a one-on-one tutor. The program also welcomes volunteers who are not teachers, including graphic designers, editors and translators. Eom says the thing he most enjoys about the program is its system. Once accepted to the program, the refugees attend a pairing day where they select their volunteer teachers. They can select as many volunteer teachers as they want, with the teachers required to teach at least three hours a month. Ryan Gardener, a TNKR volunteer teacher for over five months and tutor to six refugees, feels the program helps him give back to the Korean community. “You get lots of help from other people, it’s nice to be able to help other people like you are putting yourself out there. You just feel it’s a natural part of life here,” he says. Gardener added one of the best aspects of the program for the refugees was the opportunity to choose from teachers from a wide variety of different countries. “I think for the refugees themselves, it offers them a great opportunity to get as many different tutors as they want from different places, and I think the different places part is important to the way they learn,” he said. Lee said her work for the program was motivated by the happiness the programs bring to the refugees. Since its commencement, Lartigue says TNKR has helped over 200 refugees. Last week, Lartigue and Lee confirmed a partnership with the American Orientalism University; a move they hope will help them grow as an organization. Christine Kim, president of law at AOU, said she was more than happy to help, seeing the need for a more stable structure for TNKR to continue with future work. “I knew that as a university we could support them, of course the content and program they have already created can be led by them directly, but we can support,” she said. The chairman said the university would offer TNKR supplies, lecture rooms and offices in Seoul, in return for the program running a seminar and a journal of their work. 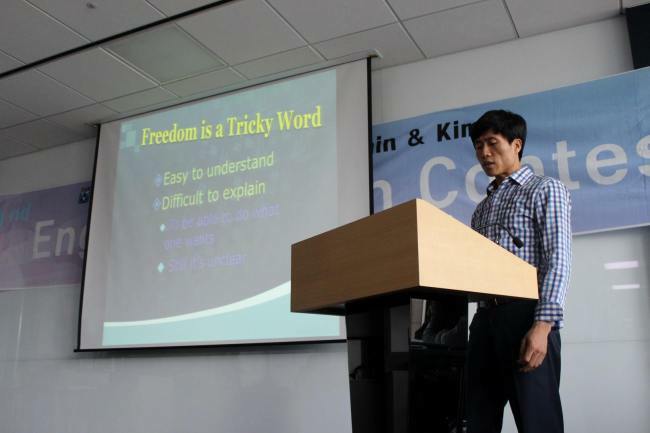 For more information about the TNKR Speech Contest or the TNKR organization, visit teachnorthkoreanrefugees.org.